Sacramental Preparation for First Reconciliation and First Communion at St. Patrick is done as family catechesis with presentations to the parents & children on Saturday mornings to help the family at home. As first teachers of the faith, we invite you to walk with your children as they prepare for the sacraments. It states in Lumen Gentium from the Second Vatican Council that, "The family is, so to speak, the domestic church. In it parents should, by their word and example, be the first preachers of the faith to their children." Children who are eligible will receive an invitation and registration letter prior to sacramental preparation. If you are new to the parish, or have not received an invitation, or have any questions or concerns, please call the R.E. office. First Reconciliation Preparation Children who are eligible to participate in First Reconciliation preparation have been baptized, had 2 years, or are in their 2nd year or religious education, and weekly attendance at Holy Mass. A Sacrament fee of $10 is due at the time of registration for 1st Reconciliation. Parents with children--8 A.M. Mass followed by parents and children meeting. Parents and Children Penance Services--9:00 A.M. in Church followed by a reception in the Classic Gym. First Communion Preparation Children who are eligible to participate in First Eucharist preparation have been baptized, received the Sacrament of Reconcilation, and had 3 years or are in their 3rd year of religious education, and weekly attendance at Holy Mass. A Sacrament fee of $20 is due at the time of registration for 1st Communion. Parents with children--8 A.M. Mass followed by paernts' and children's meeting. 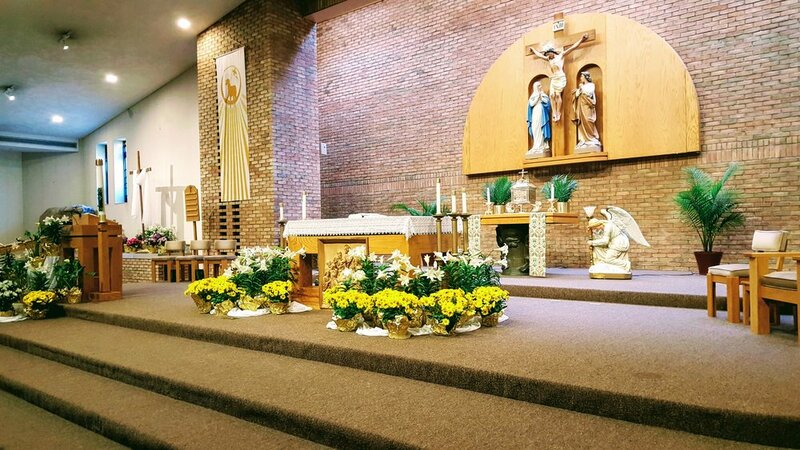 Parents with children--8 A.M. Mass followed by parent's and children's meeting in the church, and retreat in the gym until 10:30 A.M.
Children from both St. Patrick's School and St. Patrick's Religious Education Program will make their First Holy Communion together on this date. Religious Education May Crowning--11:00 am Mass. First Communicants from Religious Education will process into the church wearing their First Communion clothes and participate in the liturgy.